It started with one man and his pickup truck. Tom Banks’ then one-man operation was rooted in specialization. He wanted to identify the gaps in services offered by other companies and do his best to fill them. Formed in 2001, Banks Gas Services Inc. quickly grew from one employee to nearly one hundred. Today the company is a full-fledged gas distribution contractor headquartered in the Pittsburgh area and serving gas distribution companies in Pennsylvania and Ohio. The expanding Banks Gas workforce brought new specialty skills and services, including mainline gas and service line replacement, vacuum excavation, leak investigation and repair, corrosion protection, service abandonments and horizontal directional drilling (HDD). “If there’s something other companies can’t do or another contractor won’t do, the project owner will usually come knocking on our door,” says Tom Banks, owner of Banks Gas Services. This specialized approach means Banks Gas has no trouble staying busy. On any given day, Banks has a dozen or more crews out in the field. That busy schedule is a testament to the level of commitment and expertise the company brings to each project. Banks Gas used a truck-mounted Vermeer VX100XT AIR Series Vacuum Excavator by McLaughlin to help complete the distribution gas line project, using the unit to expose and identify underground infrastructure. Often the demands of customers lead to some very challenging bores. For example, Banks Gas Services has a contract with Peoples Natural Gas in Pittsburgh. A recent distribution line replacement job called for a 400-ft bore, so the crew could install a 4-in. gas line. While the job itself was pretty typical, the location of the project was what really put Banks Gas crews to the test. The line had to cross Bigelow Boulevard, a busy four-lane street on the outskirts of downtown Pittsburgh. Banks Gas faced extreme grade changes, crowded underground conditions, a tight footprint and time constraints — among other things. The City of Pittsburgh did not want traffic on Bigelow Boulevard disrupted for longer than necessary. Banks knows municipal planners will not hesitate to turn down a crew whose equipment is so big it requires street closures. Knowing there were strict time and space restrictions on this project, Banks Gas crews opted to use the keyhole method to locate the underground utility lines. This meant they would need limited space for the locating portion of the project, and road restoration would be minimal. 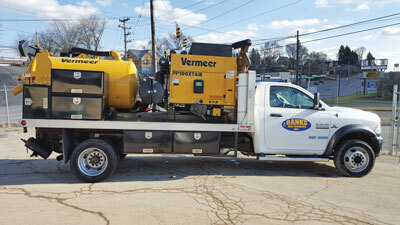 Banks Gas came to the job with a Vermeer VX100XT AIR Series Vacuum Excavator by McLaughlin and a truck-mounted core saw to expose and locate the utilities. This required only one lane of traffic to be blocked during the utility locating process. Using the core saw, Banks Gas crews drilled a 12-in. hole in the road and lifted out the coupon, which was about 14 in. thick. They were looking for a 4-in. gas line and an 8-in. water line running along the 400-ft bore. The underground was crowded with existing utility lines, which meant a great deal of maneuvering during the actual bore. Locating is not always a quick process. Pittsburgh’s underground consists of abandoned steel and cast iron lines, and, once a line is taken off the system, it’s usually not marked on maps of existing utilities. Banks knows “one-call” utility locating systems are not always 100 percent accurate, so he sends crews out to the site a few days ahead of a job to do some scout work. It can sometimes take up to five days to locate the line they’re looking for. When locating can take that long, it becomes that much more important to take up as little space as possible. To Banks Gas, locating using a vacuum excavator is always worth the additional step and extra time it takes to ensure they identify materials in the ground. For the Peoples Natural Gas project, the crew was able to locate the utilities quickly and reopen the lane of traffic within two hours. Banks Gas uses air excavation whenever possible, so they are able to reuse the spoils and backfill right on the jobsite with materials excavated out of the holes. Next they replaced the 12-in. coupon into the hole and secured it using a quick-setting grout. The crew leveled and smoothed the grout around the edges, and, just like that, the lane was ready to be reopened. Once the lane was reopened, the crew began the actual bore. The bore required that Banks Gas set up its drill — a Vermeer D24x40 Series II Navigator HDD rig — in the embankment on the north side of Bigelow Boulevard and bore 6 ft under the four-lane road and then up a quick elevation change to a 100-ft tall rock shelf embankment at a 30 percent grade on the south side of the road. Accurately locating the utilities in a timely manner was difficult, but the ground conditions on this project were especially problematic. The materials, aside from utility lines, that the Banks Gas crews uncovered tested their skills. “We’re finding, at times, railroad tracks, trolley tracks, old abandoned mains made of both cast iron and bare steel,” says Grachen. In addition to the debris, the Banks Gas crews also had to adjust to changing soil conditions. The 400-ft bore consisted of not only clay and mixed soil but also a rock shelf as they drilled gradually up the hill on the south side of the road. Banks Gas crews also came across a substance common to the Pittsburgh area called mill slag or steel slag. Steel slag is produced during the steel-making process when the molten steel separates from the metal impurities. The substance was not considered usable by steel manufacturers, so they used to dump it in what is now the outskirts of Pittsburgh. When it solidifies, it is dense and hard, similar to rock. The Banks Gas crews were able to overcome all the obstacles of this project — the changing ground conditions, the space limitation, the time constraints and the varying grades — in one shot in order to complete the bore and install the 4-in. gas line. The whole project took just under two days to complete. Banks Gas Services completed a recent project for Peoples Natural Gas in Pittsburgh, which involved replacing a distribution line. The job called for a 400-ft bore to install a 4-in. gas line. Banks Gas crews had to overcome challenges of crossing a busy four-lane street on the outskirts of downtown Pittsburgh, as well as extreme grade changes, crowded underground conditions and a tight footprint. Tackling a job like this distribution line replacement gives the impression that Banks Gas Services has been doing directional drilling projects for years. Banks doesn’t mind making it known that this is not the case. Banks didn’t hesitate to accept the job, despite the complexity of the bore. He was confident in his men and his equipment. 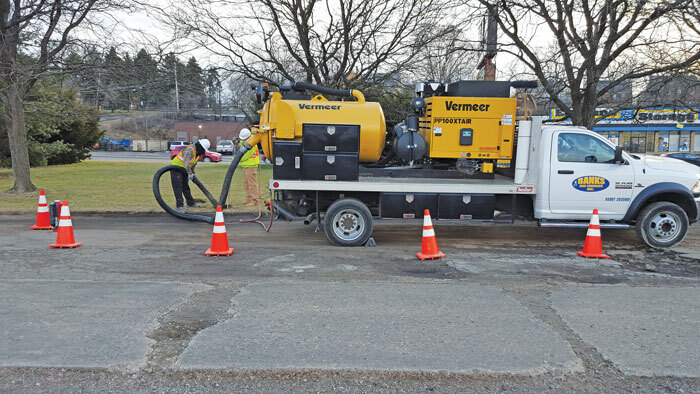 The core saw, the vacuum excavators and the directional drills Banks Gas crews use are all Vermeermodels, which allowed crew members to master the equipment quickly and thoroughly — proving again how important specialization is to Banks’ business. Meredith Augspurger is a features writer for Two Rivers Marketing, on behalf of McLaughlin, based in Greenville, South Carolina.